After a satisfyingly productive week at work I treated myself to a sumptuous and peaceful dinner out solo Friday before heading home. Sounded like such a great idea. The next morning on Pinterest I saw this cartoon and just couldn’t help but laugh because it sums up what happened afterwards so perfectly. Warning; this may be TMI for some but I think it’s too funny not to share. As I paid the bill I noticed a rumbling in my tummy and a little queasiness (I know what you’re thinking…I had half a glass of wine that’s not it). Used the facilities there before leaving just in case. Walked back to the parking garage, paid up, and realized going all the way home might be risky. I drove two blocks to my office building garage (I can only park there after hours) to further ensure I would make it home without having to shampoo the car seats the next day. I realize at some point I’ve either got food poisoning or something has triggered a serious food sensitivity. I call my mom to distract myself when I finally venture the rest of the way home (not from driving, from my gurgling stomach, I use the bluetooth I swear). We exchange funny stories of previous uncomfortable situations involving bodily functions (what is family good for if you cant exchange a few poop jokes, right)? As I pull into my neighborhood I make the left turn around the median and Crack! I swiped the corner. It sounds awful but the car didn’t jerk too much so I don’t think I hit it too hard, that is until I feel myself tilting left and the tire pressure light comes on. Ugh! I am in front of the corner service station and limp the car in at 2 miles an hour. 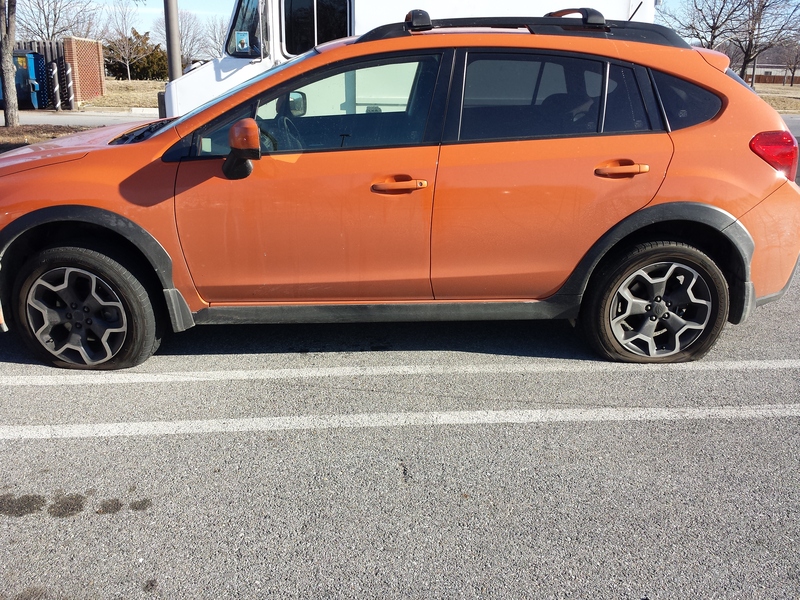 As I hang up with my parents (both on speaker phone at this point) so I can change the tire I see that not only the front but the also the rear is flat. Oh my gosh. Did you make it home, um, in time?